Burnsall, situated in the unspoilt countryside of Lower Wharfedale, is a small very pretty village and is said to be one of the prettiest in the Yorkshire Dales. The village surrounded by a stunning landscape sits on the River Wharfe and is in the Yorkshire Dales National Park. 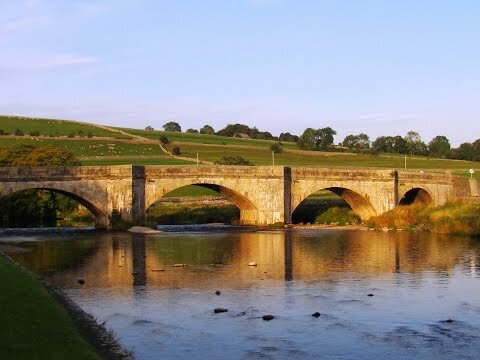 The village green and the five arched Burnsall Bridge which crosses the river contribute to its prettiness. The village green and the field car park are fantastic places to relax, enjoy the scenery and have a picnic. Burnsall is also a centre for walking, trout fishing and weddings. In August the annual feast day games includes, amateur competitions such as canoeing, tug of war and fell races. Downstream of Burnsall are the ruined historic monuments of Barden Tower, Bolton Abbey and the treacherous stretch of river channel known as The Strid. Also nearby is Loup Scar, the village of Appletreewick and the limestone gorge of Troller’s Gill in Trollerdale which is said to be haunted by Scandinavian trolls and a huge spectral hound with eyes as big as saucers. Simon’s Seat standing at 485 metres is a prominent outcrop of millstone grit situated on Barden Fell and is visible for many miles around. Barden Fell is a huge area of open access moorland owned by Bolton Abbey Estate and where grouse have been shot ever since it became a popular sport in Victorian Times. The estate allows free access to the moorland except when they are shooting. Appletreewick is a tiny village with wonderful views of Simon’s Seat. It houses a caravan and campsite, two pubs the New Inn and the Craven Arms which has a Cruck Barn behind the building for special events such as weddings, birthday parties and anniversaries. We walk over the bridge and take the path on the right and bear slightly left in front of the toilets over the field car park towards the river. We just follow the River Wharfe and the arrows on The Dales Way passing through a farm then past the bottom of the caravan park until we reach a small road. We turn right over the bridge and immediate left and follow the lane uphill. At the cross roads of tracks at Howgill and we head straight over uphill past the Barden Fell and Barden Moor information board. We keep following the path and a sign post “Route to Simon’s Seat”. We follow the track with the wood on our right and then the track turns sharp right into the wood. We keep following the track as is zigzags uphill until we see a gate. The gate is locked so if you look to the left there is a footpath sign at the side of the wall. We follow this go over a stile and head forwards uphill to the end of the trees. We turn left and follow the wall on our left with the moor on our right, uphill. The path bears slightly right away from the wall to reach the rocks of Simon’s Seat which has a trig point on its summit. Just below the rocks we turn left on the stone flags and start heading downhill. The path bears right and we keep heading forwards to cross over a stile in the wall. We continue forwards and just before some trees we turn sharp left and follow the zigzag path downhill to the farm at the bottom. At the farm we turn left onto the track and follow this to the crossroads at Howgill. We turn right here and retrace our steps back to Burnsall. This is an easy to moderate walk on distinctive grass, stone, gravel paths and tracks. The actual ascent and descent of Simon’s Seat is steep in places. Approx 8.3 miles allow 4 hours using OS Explorer Map OL2, Yorkshire Dales, Southern and Western areas. This walk is done anti-clockwise. Start point: The Village Green next to Burnsall Bridge. Burnsall in Lower Wharfedale in the Yorkshire Dales. From the A1(M) take the A61 to Ripon. At Ripon take the B6265 through Pateley Bridge, past Hebden then continue to Grassington. Stay on the B6265 and at the main t-junction turn left onto the B6160 and follow this road to Burnsall. From the A1(M) take junction 47 onto the A59. Keep on the A59 through Knaresborough, Harrogate and along Blubberhouses to the roundabout at Bolton Abbey. Take the third exit onto the B6160 and follow this road to Burnsall. Parking: Pay and Display car park £3 for all day, the field car park owned by the villagers is pay on exit and there is some free road side parking. There are public toilets in the car park and also in the field car park. For refreshments there are two pubs/hotels the Red Lion and the Devonshire Fell a village store, the Wharfe View Tea Rooms and Katie’s Kiosk in the car park. Min stemme gÃ¥r ogsÃ¥ til John. LÃ¦kre detaljer og god belysning pÃ¥ forgrunden. Og sÃ¥ er det altid godt med mennesker/fugleskrÃ¦msler(?!) pÃ¥ et billede. C’ÃƒÂ©tait vraiment obligÃƒÂ© le spoil de Portal 2 ÃƒÂ 50 minutes? Non parce que lÃƒÂ c’ÃƒÂ©tait un peu violent quand mÃƒÂªme. Je plains ceux qui ne l’ont pas fini s’ils voient ÃƒÂ§a. Hi Jaybee and welcome to the blog.Sorry for the delay in getting your first post moderated.Do you think that “abandoned” in 27a as well as being the definition could also serve as an indication that the tube station is no more? above, the cops tell us that our response is in no way unique. The trick isn’t that a community has power, but rather that you must HAVE a community. In places where people don’t know their neighbors, don’t trade Christmas cookies, don’t know the neighbor kids schedules and birthdays, can’t name and call every dog and cat in the neighborhood, then yeah, it would be hard to do something like that. On the block where I live….. not so much. Moje prvnÃ­ dvÄ› zkuÅ¡enosti byly pozitivnÃ­. V nedeli 2.9. veÄer: protoÅ¾e autobus 123 jezdÃ­ mÃ­sto jednou za 30 minut dvakrÃ¡t ÄastÄ›ji, tak jsem uÅ¡etÅ™il na cestÄ› z letiÅ¡tÄ› (jel jsem pÅ™es Motol a tedy ne pÅ™es AndÄ›l) asi 20 minut.ZmÄ›ny mi kupodivu pomohly i v pondÄ›lÃ­. Jel jsem rÃ¡no a odpoledne autem pÅ™es Prahu a zdÃ¡ly se mi menÅ¡Ã­ kolony. Autobusy teÄ prÃ½ najedou dennÄ› o 7000 kilometrÅ¯ mÃ­Åˆ. Vyklidily tak na ulicÃ­ch dost mÃ­sta.